We are proudly launching our first Reconciliation Action Plan (RAP) during National Reconciliation Week. Our Reflect RAP is a symbol of our commitment to grow understanding and respect of Aboriginal culture and create more opportunities to work together with our tenants and the broader Aboriginal community. 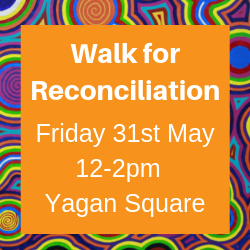 To celebrate the launch of our RAP we’d like to invite our tenants to join Foundation Housing staff as we Walk for Reconciliation together to show our support and solidarity for the reconciliation movement. The Walk for Reconciliation commences with a Welcome to Country from Aunty May Maguire at Wardang Gardens – Milligan St and Telethon Avenue (next to RAC Arena), and will finish in Yagan Square with performances from Noongar artists, musicians and story tellers along with face painting for the kids. We would love our tenants to come and walk alongside our staff. This is a free event and everyone is welcome so please bring your family and friends. If you can, let us know if you are coming by phone our reception on 9422 0700 so we can meet up with you on the day and walk as a group.